Commissioned by Ensemble Kore with the support of the Canada Council for the Arts. Recipient of the 2011 Jules Léger Prize for New Chamber Music, Canada’s highest honour for composition. Bel Canto is above all a portrait of Maria Callas, based on her live recording of Puccini’s Vissi d’arte – with all the full generosity of her vibrato, swoops and portamenti. At the beginning, it’s as if we hear her young voice, and towards the end, the voice of her later years. The path of the piece is not only about the ageing of an extraordinary woman, but also about the listener. Time slows down to allow for an engagement with detail, for a submersion in the sound, and for meditative stillness. 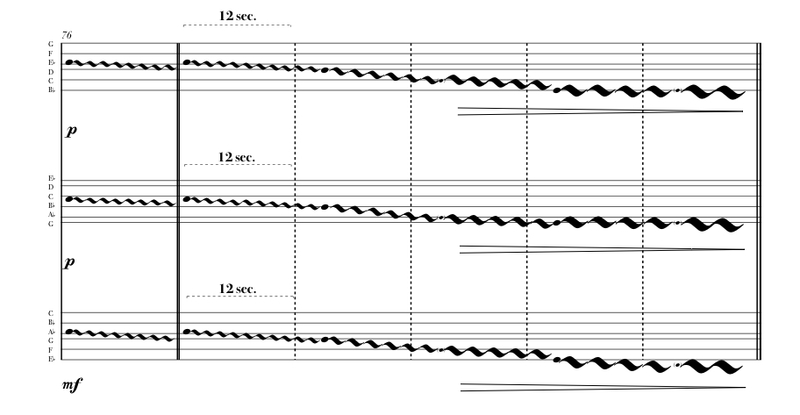 Two simultaneous ensembles perform independently of each other. This makes for layers of melody, creating a sonic depth of field – echoing the depth of the Greek landscape in which I felt the warm revelation that originally inspired this piece. Separating the ensemble into two smaller groups, without conductor, enables an intense chamber-listening between the players. This intimacy allows them to carry out with great musicality the non-notatable qualities of the swoops and vibrato, and the unnamable subtleties of vocality.